Oh, what a deliciously horrific idea this movie was! Of course, the real reason why six years have elapsed since the release of the first movie is that “Alice in Wonderland” is a singular work children’s literature, and Lewis Carroll’s follow-up novel is so bonkers and beautiful that it would sooner lend itself to the acid-warped visions of Alejandro Jodoworsky than it would the disembodied corporate ethos of Walt Disney. Screenwriter Linda Woolverton was tasked with taking a book that Suzanne Todd describes as “essentially an allegory of a chess match and a bunch of random and bizarre episodes from Caroll’s life which don’t bear any relation to one another” and bending it into a piece of family entertainment that can play in China. On the one hand, Lewis Carroll is the Thomas Pynchon of young adult literature, and “Alice Through the Looking Glass” is his “Gravity’s Rainbow.” On the other hand… money. Helmed by “The Muppets” director James Bobin, “Alice Through the Looking Glass” begins with the flaxen-haired heroine (a contractually obligated Mia Wasikowska) returning to civilization after a successful stint as the captain of a sailing vessel. Stepping on to dry land, Alice discovers that Victorian England is not the most hospitable place for a young woman of grand ambition and fierce potential. Doofy aristocrat Hamish Ascot (Leo Bill), still bitter about how Alice rebuffed his marriage proposal in the previous film, puts the kibosh on the girl’s maritime career, and essentially forces her to choose between working in his mailroom or giving up her mother’s house. Frustrated by the grim realities of adult life, Alice once again retreats into her imagination, following a familiar blue butterfly as it flutters into a mirror in a back room of Hamish’s mansion. As fans of the first film could tell you if they existed, this luminous insect is Absolem, and — for his brief appearance — he’s voiced by the late Alan Rickman in his final performance. It’s a tragic way for one of the greats to say goodbye, tragic enough that ignoring this movie entirely could be construed as a respectful tribute. Alice follows Absolem through the liquid surface of the looking glass, and finds herself back in the psychedelic hellscape of Underland. Yay. Once again located somewhere between Narnia and “Jacob’s Ladder,” Underland hasn’t changed much since the last time we saw it. The place is still a garish kingdom of nightmares, like a server full of CG imagery melted onto the screen. If the Mad Hatter has lost much of his muchness, then the realm in which he lives still possesses much too much of it. Gaspar Nöe can only dream of creating such a perfect vision of hell. And poor James Bobin, who’s powerless to fight back. Woe to the people who agree to direct the sequel to a Tim Burton movie, painted into a corner of bug-eyed gothic maximalism. Remember “Batman Forever”? Joel Schumacher tried to wiggle free from the groundwork of Burton’s aesthetic, but was ultimately unable to escape. For Bobin, the situation is even more grim, as this particular film world is its aesthetic. Worse still, its inhabitants — which include some of the most unappealing characters ever projected onto a movie screen — are a direct outgrowth of their environment. Wasikowska is a stubbornly compelling talent even in the worst of circumstances, but even she can’t save this franchise from yet another story that reduces Alice to less of a character than she is a tour guide through a miserable world and a friend to every member of its noxious population. And that’s exactly what “Alice Through the Looking Glass” asks Alice to do, as Woolverton’s script plunges its heroine deep into the folds of Underland, quickly severing any connection between her dreamland adventures and the real world problems from which she’s escaping. 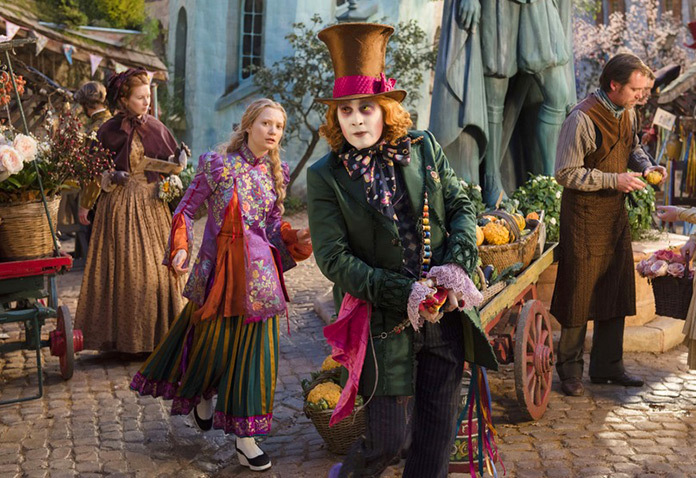 The gist of this senseless plot is that the Mad Hatter… you know what? It really doesn’t matter. He’s sad, and Alice needs to go back in time to make him less sad. In order to do that, she must visit Time himself (Sacha Baron Cohen as a humanoid clock), a refreshingly conflicted antagonist who is part Grim Reaper and part cosmic architect. 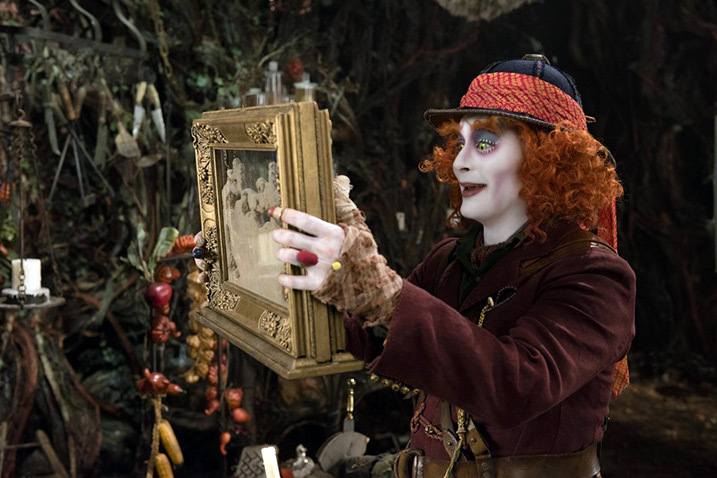 From him, Alice nabs a device called the Chronosphere, which allows her to pop into the past and prevent the moment in which a teenage Hatter sparked the feud between the Red Queen (an overcooked Helena Bonham Carter) and her angelic sister (an inarguably sentient Anne Hathaway) and doomed his own family. Remember, in “Alice in Wonderland,” when Alice said “It’s no use going back to yesterday, because I was a different person then?” Well, she appears to have forgotten. It’s a shame, as her attempts to change the past only result in more trouble — “Through the Looking Glass” subscribes to the fatalistic “La Jetée” logic of time travel, which means that Alice only burrows further down the rabbit hole with every good deed. But that the film subscribes to any logic is part of its problem, as everything about Carroll’s creation exists in defiance of a “proper,” restrictive order. As Alice runs from one hollow set piece to another, hitting every standard mark that a colossal movie like this must in order to pay for itself, her adventure grows less and less interesting with every turn. By the end, all that lessness is too much for the muchness to match it. Less is usually more, but when it comes to this franchise, none would be ideal. “Alice Through the Looking Glass” opens on May 27.